The highlight of a two-week backpacking trip in Alaska’s Arctic National Wildlife Refuge (or “ANWR” as it is known by its reductive acronym), which I guided this summer, were thousands of caribous from the Porcupine Herd that streamed past our camp on two consecutive days. They formed the vanguard of the annual fall migration, during which the herd returns south to congregate near the tree line for the rut. After dropping their calves in June, the animals had been fattening up on the coastal plain for their 400-mile return trip in late July. The leaders first alerted us to their presence with old-man grunts. Emerging from our tents, we watched in awe as the brown tide flooded the hillside, pulled by millennia-old urges. Their musk hung heavy in the still air. In some Brooks Range valleys and passes, the earth looks raw, plowed by caribou hooves — 90,000 to 170,000 ungulates annually engaging in North America’s largest land mammal migration aptly suggest what bison herds on the Great Plains must have been like. Congress is currently reviewing a proposal, to preserve the caribous’ calving grounds — the famous 1002 Area of Alaska’s Arctic coastal plain — as a wilderness area. Hopefully, the public will keep this amazing world heritage intact for future generations of humans and caribous (and bears, wolverines, wolves, eagles, plovers, gyrfalcons, Dall’s sheep, etc.). 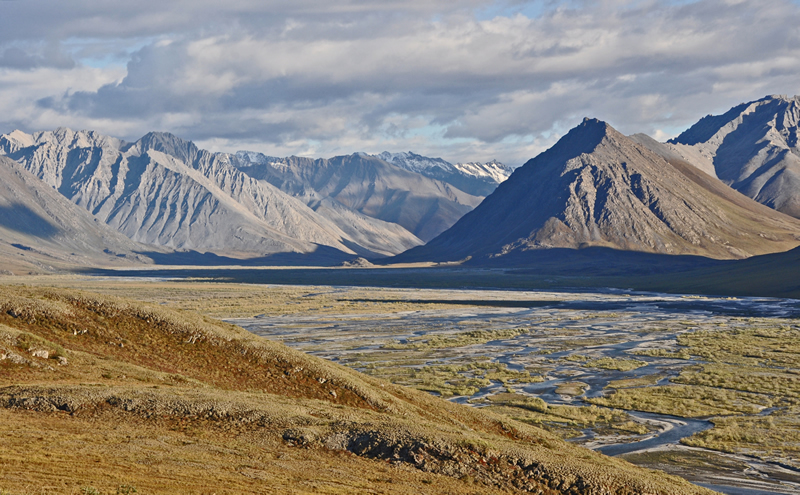 Almost as big as South Carolina, the Arctic National Wildlife Refuge is the setting for life cycles that essentially unfold as they did at the end of the last ice age 12,000 years ago. 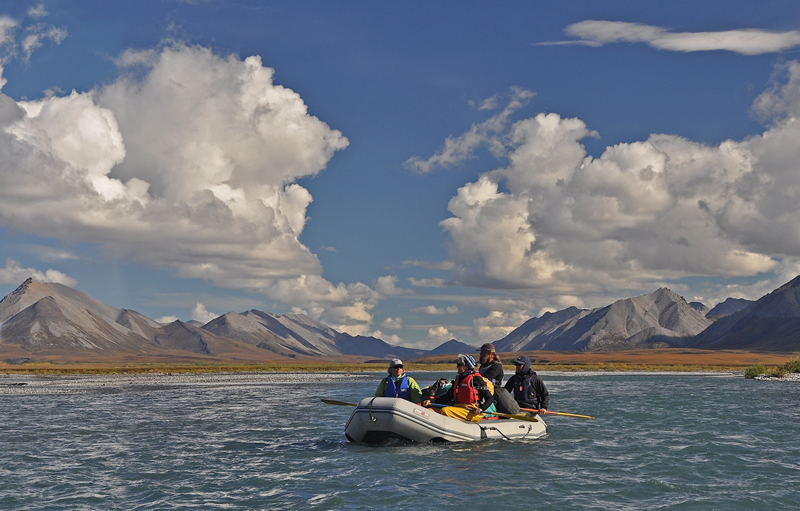 The expanse between the Inupiaq-Eskimo village of Kaktovik and the Gwich’in Indians’ Arctic Village 140 miles due south harbors the greatest wildlife diversity of any protected area in the circumpolar North. Nourished by summer’s constant daylight, hardy vegetation supports unrivaled wildlife concentrations in this part of Alaska’s Arctic. 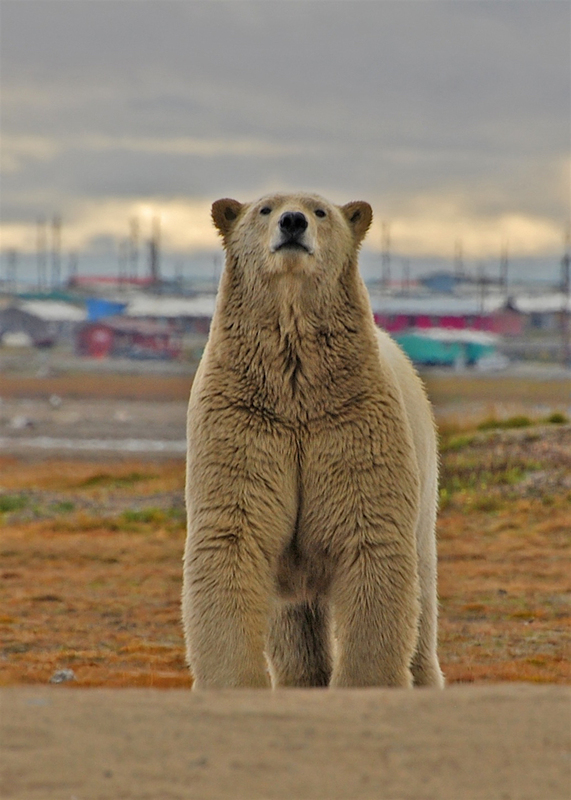 The refuge is crucial for polar bear survival. It contains the highest concentration of denning sites in Alaska along a 125-mile stretch, the only segment of the state’s 6,500 miles of northern coastline still closed to drilling. Outside this sanctuary, oil production and seismic exploration often drive female polar bears and their cubs from cozy dens, exposing them to the steel bite of Arctic winter. Any spill — onshore, at pipelines or drill rigs, or offshore, from ships in the now-ice-free Northwest Passage — threatens the food sources of both people and bears. Silence and solitude only enhance the riches of this incomparable land. Within minutes spent by the shores of one of its gin-clear rivers, the murmur of riffles strips away civilization’s cares. The closest road is the “Haul Road,” unspooling invisibly to the west. Officially known as the Dalton Highway, its washboard surface shadows the pipeline between Fairbanks and Prudhoe Bay. The human touch has been felt in this country for millennia, although lightly. As early as 13,000 years ago, hunters crossed the then-exposed Bering Land Bridge in search of game. 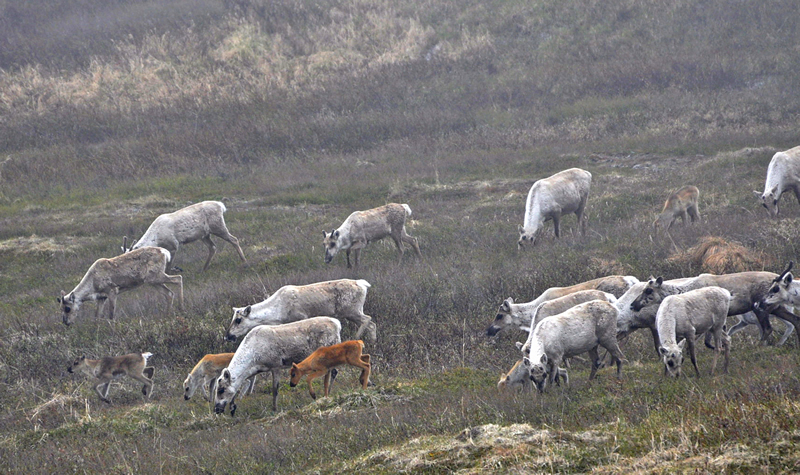 Their descendants still depend on caribou as a way of life, for physical and spiritual sustenance. Data gathered in the past 50 years in the western Arctic show that winter temperatures in this region have increased as much as 7 degrees F and snow cover has diminished proportionately. I keep seeing slumped riverbanks where permafrost melted, and tinder-dry tundra, and summit days sometimes aren’t worth the effort because wildfire haze now obscures the view. Many Inupiaq and Gwich’in fear that a warming Arctic or renewed attempts to open the refuge to oil and gas drilling might send the Porcupine caribous the way of 19th-century bison. 2010 marked the 50th anniversary of the refuge’s creation, celebrating the first time in American history that an entire ecosystem was granted federal protection. From its very beginning under the Eisenhower administration, the refuge sparked political and economic controversy. Of a total of 19 million acres, only 8 million were protected as federally designated wilderness. Congressional authorization is necessary before oil drilling can proceed in the 1002 Area. Luckily, the price of oil is down, and the managing agency (the U.S. Fish and Wildlife Service) is recommending wilderness status for it, the highest level of protection for any public lands. Now it is up to Congress — and the American people — to safeguard this wildlife nursery. The refuge was set aside for the animals, but make no mistake: we need it just as badly. My personal history with this region spans over two decades. Conducting anthropological fieldwork for the University of Alaska and the National Park Service during the early 1990s, I fell hard for the Arctic. Since then, much of my writing and life have revolved around the land of stunted — or no — trees. Together with the Grand Canyon, this is my favorite place in the world. I encountered my first wild polar bear here, 30 miles from the coast, the farthest inland sighting ever recorded for the refuge. The story of that chance meeting is in Ice Bear, the book itself a result of my long obsession with bears and wilderness. Unable to find one that explains our fascination with the White Bear (comparable, say, to Barry Lopez’s Of Wolves and Men), I decided to research and write my own. I was not the least bit surprised to learn that this creature magnetized people and cultures across time. I was very surprised how persistent and widespread some beliefs and attitudes regarding this species have been. For the first time I saw to what degree this wildling has served as a screen onto which we project our fears and desires. In my guiding and my writing about the bear and the Arctic, I continue to face some dilemmas. I wonder if on some subconscious level, I seek out the blighted and rare before they can disappear — a predilection mocked as “extinction tourism.” The fact that the clients I guide essentially fund my wildlife viewing and that the pollution I leave in my wake possibly outweighs any awareness I hope to instill further complicate matters. “A few recovered species don’t compensate for the lost company of great beasts,” the marine biologist Carl Safina writes. Sadly, he’s right. But here there still are some wildlings, and we in their company, finding a measure of peace in seamless days on the tundra or rivers. I know that whenever the refuge plays big in the media because yet another attack on it is being launched, more visitors come. Many with whom I speak confess that they want to see this place while there is still time. What we all feel, I’d like to believe, is a mixture of helplessness, guilt, and regret rather than morbid, rubbernecking curiosity. Like conscientious criminals, we are drawn to the scene of a crime, witnesses and perpetrators rolled into one, forever haunted by our deeds and sins of omission. Perhaps, in the great beasts’ presence, we are hoping to somehow be forgiven. As an “environmental” or “nature” writer, I trust that books (and images) can change lives and even save some. In 2001, one of Alaska’s pro-development politicians raised a blank white poster board on the U.S. senate floor like a modern-day Ahab poised for a strike. “This is what ANWR looks like nine months of the year,” he said, trying to persuade fellow senators to open the refuge to resource extraction. An opponent to drilling later held up a book with photos of winter scenes and polar bears emerging from dens in the alleged white waste. The refuge remained inviolate, for the time being. I firmly believe there are landscapes that speak to certain individuals more than others do, even to the extent where only one place ever makes a perfect match for such a person. A first exposure to this kind of “soulscape” feels like a homecoming. Fortunately, I have found not one, but two: the Grand Canyon and the Arctic. Unfortunately, lying 2,500 miles apart, they have sentenced me to a lifetime of wandering. I still consider myself lucky, as a wilderness guide of 25 years, to have spent my best days in these two magnificent regions. Like the canyon’s, the coastal plain’s bare look is deceptive. It too is truly a place where much life begins. 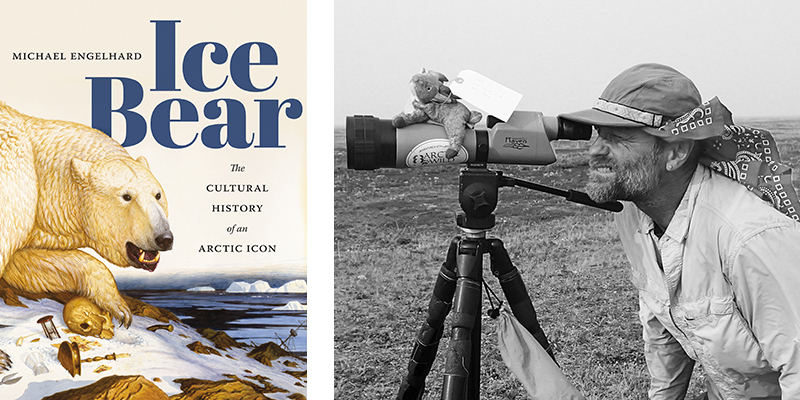 Michael Engelhard is the author of a new essay collection, American Wild: Explorations from the Grand Canyon to the Arctic Ocean, and Ice Bear: The Cultural History of an Arctic Icon. He lives in Fairbanks, Alaska, and works as a wilderness guide in the Arctic.